Image credit: courtesy of The peninsula Hong Kong. Tablet-controlled luxury: The Peninsula Hong Kong. Travel, the world’s third-largest industry, is on track to grow nearly 4 percent annually over the next decade, outpacing global economic growth, according to the World Travel & Tourism Council. Increasing demand and new technology are driving promising developments that should make business travel more pleasant, from airplanes with party rooms to suitcases that tell you where they are. Contractor Skanska USA has identified three key factors driving airport design today: bigger planes, the need for flexible and efficient security screening and the ability to accommodate the increased time passengers spend in terminals (an average of 108 minutes, a figure that has more than doubled in the past decade). In the terminal, biometrics may replace your driver’s license. Clear, a membership service that captures your fingerprints and iris scans, is providing biometric identity measures at 12 U.S. airports. Plans for the new Terminal 4 slated to open at Singapore Changi Airport in 2017 include biometric scanning. The Internet of Things will come to bag tags. AT&T is developing a smart luggage tag with real-time tracking that may, for example, allow travelers to pinpoint the location of their suitcases in baggage claim. In its “Future of Travel 2024” report, travel search engine Skyscanner noted that British Airways and Microsoft have each tested smartphone-activated digital bag tags that eliminate paper. Customer service is also going virtual. JetBlue, Verizon and VGo have teamed up to create Crewbot, an adult-size robot with a screen that displays a service rep working remotely to answer questions; the project has been tested at Terminal 5 at New York’s John F. Kennedy International Airport. After years of customer complaints about airplane design, a nice twist: Cabins may end up looking and feeling more welcoming. Airbus recently designed a concept cabin that eliminated traditional first, business and economy classes in favor of areas to relax, play games or hold meetings. In Germany, designer Ugur Ipek has drafted a future airplane that boards from the middle, with wider aisles that taper at the nose and tail to allow two-way passenger traffic. Once you’re at your seat, you may be welcomed with personalized messages. Brazil’s TAM Airlines recently experimented with a printed in-flight magazine that featured bespoke content for each passenger. Ad agency FCB Milan designed the magazines based on information gleaned from Facebook during the ticket purchase process. Though a one-off for now, the idea could be applied affordably to seat-back screen versions in the future, according to the agency. The hotel room of the future may look very much like those at The Peninsula Hong Kong. After running an innovation workshop, in 2013 the 300-room luxury hotel introduced completely wired rooms in which every selection, from the TV to the drapes to the temperature, is controlled via tablet computer. (Several of the devices are distributed throughout suites for easy access.) The technology will be introduced at The Peninsula Chicago this fall. In addition, room designers have taken steps to relieve small pains by custom-fitting every drawer, cabinet and closet and labeling each with its contents, so there’s no more wondering where the blow dryer is hiding. Smart mirrors at Four Points Hotels. Starwood Hotels and Resorts, which previously announced Botlr, a prototype robotic butler, has developed concept rooms across its portfolio of business-travel-friendly properties. Starwood’s Aloft Hotels plans to allow guests to control room temperature, lighting, alarms and even coffee-making via their own mobile phones. Element is planning smart lighting that automatically illuminates a path to the bathroom when guests get up in the middle of the night, as well as lighting options that will enable jet-lagged travelers to adjust their circadian rhythms. 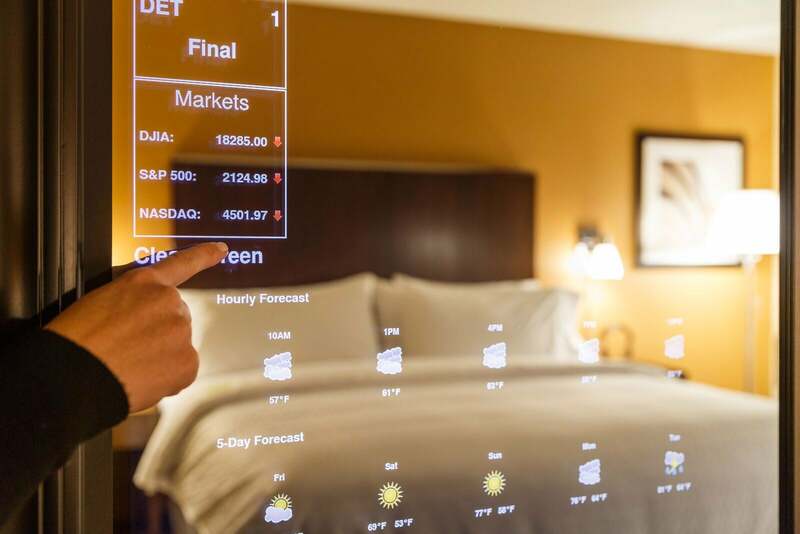 Four Points Hotels will have touchscreen-enabled “smart mirrors” that display news, weather reports and sports scores while guests primp in the morning. Personalization may also lead to custom minibars, as well as other guestroom spaces. French clothing company Pimkie is selling women’s wear through the closets of Antwerp’s Banks Hotel. Guests who decide to take an article of clothing (or the entire wardrobe) can pay for it during checkout. Already being transformed by virtual programming is one of the most neglected areas of hotels: the gym. The Four Seasons Resort Orlando offers virtual trainers exhorting guests to push it in virtual spin classes. Several startups are racing forward with smart suitcases, including Bluesmart, which blew past its Indiegogo campaign targets and expects to deliver its wired luggage in November. An app controls the case’s digital lock and offers a proximity sensor, location tracking, digital scale and built-in phone charger. Luggage maker Delsey has proposed Pluggage, a wired wheelie bag with a built-in scale, inside lighting and speaker system, fingerprint-triggered lock and phone charger. An app will tell you when the case is onboard the plane and provide a destination guide.